Andrew Badenoch is the instigator of the Feralculture Land Liberation Project and ardent moderator and primary contributor of the Intentional Paleo Community group. Having become disenchanted by the game of capitalism, he struck with the allure of the hunter-gatherer life and started taking steps in that direction laying groundwork for more to follow. We’ll certainly be keeping up with the land project, but the ideas around it and questions that have arisen have brought forward some really promising discussion, so we’re always happy to host it here. Can you talk a bit about the land project, what it’s called and where it’s coming from? 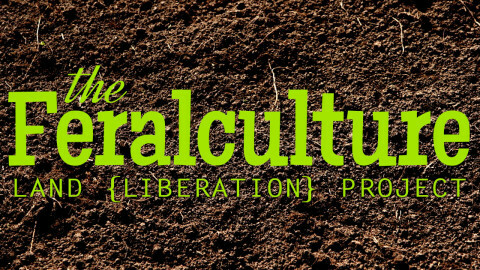 The working title is “The Feralculture Land Liberation Project”, which is an outgrowth from ideas discussed in the “Intentional Paleo Community” Facebook group started around September of 2012. 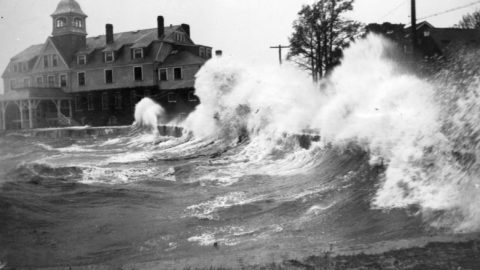 The community or communities under that umbrella may evolve different names over time. To the extent that it’s currently possible, we’re shifting updates and ongoing discussion of the project to feralculture.com to reduce our contributions of free labor to the Facebook empire. In short, we’re working to build something like an immediate-return hunter-gatherer community in the cracks of an insane delayed-return society. We also recognize that biomes friendly to wild human cultures have been obliterated in many ways. With that in mind, we consider a rewilded permaculture to be a useful bridge for regenerating what agricultural-industrial society has killed. Our vision is to create and expand a global network of community land which is a living laboratory for the ethnogenesis of a renewed hunter-gatherer culture and the regeneration of landscapes necessary to support it. The implementation resembles an umbrella community distributed across clusters of nodes. We’re not thrilled with that jargon, but think of a bioregional cluster of 2-5 properties that people could realistically travel between, without mechanized transport, in 3 days or less. Each property (node) would be roughly 3-15 acres. So rather than an insular land project of 100+ acres, our 100+ acres is spread out over a wider area and not contiguous — looking something like a series of camps hunter-gatherers might travel to and from at various points in the year as individuals or groups. Each cluster of nodes would be farther apart, and people could travel between these wider biomes if desired, or devote time to deepening their connection to the landscape in a single cluster. Often when explaining this, I get, “oh, like a hunter-gatherer time share?” Perhaps we’re missing out on a growth market by not offering free trips to Florida for coming to a presentation. But I see what they’re getting at. In a sense, joining the community is like an all-access pass, but the soulless condo/hotel is replaced by a living entity spread across the land, and there’s no blackout dates, scheduling, or required checkout times. Before getting too far into this, I’d like to throw out the disclaimer that we recognize multiple problems with the ideas and language of land ownership discussed here. We’re sympathetic to critiques along various lines, including those argued by Thomas Paine and Henry George; the various, nuanced, and diverse historical problems of colonization and destruction of indigeneity, and standard anarchist critiques of property. Unfortunately, our primary limitation seems to be the system of state sanctioned property, and our discourse often gets mired in that framework. Our hope is to liberate as much land as possible from agriculture and its derivative systems of extraction and violence. The fine print on every U.S. National Forest sign, “U.S. Department of Agriculture”, can be seen as a microcosm of the totalizing tendency inherent in the agricultural orientation to the world — the tendency we strive to unwind. So you’re involved with a land project that has its roots in understanding the role movement played in nomadic hunter-gatherer communities where the purchasing is looking at nodes rather than just massive plots. How did this idea come about and how does it look and function differently than most land projects out there? The earliest impetus was the simple recognition that the diets of hunter-gatherers (foragers) seem to yield healthier humans, and the social life of hunter-gatherers seems to yield happier humans. Whether or not that’s true, a hyper-rational, scientific fundamentalist culture purporting to deliver health and happiness would, by its own logic, have to consider the merits and implications of this competing hypothesis. If it is true that foragers are healthier and happier, said culture would, by its own rules, face the paradox of dismantling itself or revealing its narrative as fraudulent. That’s where the philosophical gambit began, and since civilization will regurgitate fraudulent narratives as long as it can, the question of everyday life quickly moved up in priority. The next element of the quandary was trying to square the widespread failures of intentional communities — over the past century — with the strong and resilient community tradition that seemingly existed among hunting and gathering Hominin for upwards of 2 million years. On one hand, there’s this tradition of apparently sincere and well meaning individuals trying their hardest and sacrificing greatly to foster a deeply felt impulse to live in community within an agricultural context, and failing at high rates. On the other hand, there’s the ethnographic record rife with peoples living in wildness with intimate communities persisting almost incidentally. In practice, fostering community is something “intentional” even among the undomesticated, but it doesn’t look quite the same as the various flavors of modern intentional communities. Something’s going on here, and apparently something consistent. The question inevitably becomes, what is that something? The only way I’ve yet found to bridge that chasm is through pursuing the idea of forager norms (and perhaps values, but that rapidly gets complex) versus agriculturalist norms (with pastoralists and horticulturalists imprecisely, but not arbitrarily, tossed in with the latter). This arrives at the fundamental divergence in mobility orientations between hunter-gatherer cultures (nomadic, non-sedentary, immediate-return, etc.) and agricultural cultures (sedentary, delayed-return, etc.). Foragers must move regularly for subsistence reasons, and farmers can’t move regularly for subsistence reasons. The implications of this difference to cultural adaptations permeate life. Anthropologists and archaeologists are quick to complete the story of the instantiation of private property, division of labor, hierarchy, patriarchy, zoonotic disease, theism, and the other unintended consequences of the civilizing process. Consider limits to consumption and production, and redistribute surplus to the benefit of 1 (earth) and 2 (people). If permaculture’s founders, Dave Holmgren and Bill Mollison, hadn’t realized the flaws in thinking about the concept as “permanent agriculture”, and scuttled that in favor of “permanent culture”, we would reject it. And though the movement can feel subsumed by farmers and gardeners and capitalism, Holmgren, Mollison, and Mollison’s protégé Geoff Lawton all give nods to hunter-gatherer life as a model from which to learn. Since they did drop the agriculture bias after seeing permaculture’s broader potential, and they do recognize forager life as a source of inspiration, and hunter-gatherers have demonstrated the closest examples we have of permanent cultures, interpreting the three ethics along those lines seems the most reasonable place to start. We also take the rejection of agriculture further than most permaculturists, but feel on firm footing with Toby Hemenway’s article implying that sustainable agriculture is an oxymoron. We diverge through our view that permaculture, when taken to its logical conclusion, is, and can only be, fundamentally anti-agriculture. Put simply, we forward the hypothesis that intentional communities drawing from agricultural principles in designing for any of the three ethics will inevitably fail. The only question is when. We find a pervasive problem with modern intentional communities in their consistent embedding of agricultural norms and values into their designs. An example of embedding agricultural norms into the first ethic of earth care is in communities that purchase massive plots of land with the intent of bringing it under annual cultivation. It doesn’t matter if these communities attempt to embed forager norms against private property and hierarchy into the second ethic of people care, they cannot and will not be permanent. Examples of embedding agricultural norms into the second ethic of people care are in communities that: (1) operate as proto-feudalist domains where owners of the land arrange tenant farmer relationships and/or exert hierarchical control over the decision making or governance of the community; (2) enforce the private property fantasy of land ownership in which plots are subdivided and sold to individuals or families to which differential access is more or less permanently granted, and from which other community members are largely excluded; (3) grant power to overt or quasi-religious leaders or tendencies. The oft maligned third ethic is more difficult to discuss due to political orientations bending the ambiguity to their will, but from an anarcho-permaculturalist perspective, a capitalist orientation toward the work and lives of plants and animals would be one example of embedding agricultural norms into the third ethic of returning surplus to earth and people. Do you have a vision for how hunter-gatherer life impacts the way this community ideally would be built and expand? Indeed. Our proposed solution to the problems of modern intentional communities is to design new iterations with the three ethics aligned along forager norms. One of the primary ways of achieving this is to draw from the mobility norm found among hunter-gatherers. This is the direct inspiration for the rejection of community as a single insular tract of land. Rather, we attempt to carve out a non-sedentary community distributed across a network of smaller properties. These individual enclaves would not function as healthy communities on their own, and would not support band size populations in isolation. However, when modeling forager movement patterns in the context of the private property framework of the nation-state, a network of small properties begins to resemble a pattern of mobile camps, particularly when mapped over time. We don’t claim to perfectly echo the movement patterns of wild humans, merely that this appears to be a best practice within the current reality. Unlike the agricultural norms inherently installed in a single property community compound, the distributed node-cluster framework embeds hunter-gatherer norms into the first ethic of earth care. This choice extends benefits into the second ethic of people care as well by aiding forager social norms associated with mobility. Band societies frequently use a network of fission-fusion camps as a release valve for conflict. Rather than the dim notion that individuals expelled from one hunter-gatherer band faced impending death, asking someone to leave often resulted in the exiled joining a band in the larger regional network (or cluster, in our case) of friends and relatives comprising multiple options. Of course, egregious offenders could be urged to leave the entire regional group considering communication between them tends to be regular, and social pressure is regularly used to curtail dominant or violent behavior. The fluid membership of each band in concert with the fluid movement of each band is a norm we attempt to draw from with a focus on purchasing multiple small properties rather than a single large one. Further, this approach can often be leveraged by favoring the purchase of nodes that border state or federal land open to hunting, fishing, and gathering. Unlike most intentional communities, we disabuse the notion that all land from which we draw sustenance must be legally owned by the community. Does a nodal project offer unique limitations? Definitely. One limitation is that small parcels of land can be more expensive per acre. This is not always the case as some areas command higher prices for large contiguous tracts. There’s also the problem of interacting with multiple bureaucratic jurisdictions. Community decision-making and self-governance (again, language we don’t like but end up using due to our context in spectacular capitalism) becomes more complicated as interests and personalities are multiplied by multiple properties with multiple features and multiple needs. Can you tell us about where the project is at now and where you’d like to see it grow? We’ve provisionally purchased the community’s first node in the abundant hunting and fishing region of interior Alaska. It’s riverfront property on a river with large salmon runs and a variety of large and small game, waterfowl, and other fish species in the watershed. This particular piece also has the benefit of being mostly surrounded by state land, which is the least restricted classification in the jurisdiction of Alaska. At the time of this writing, we have not begun accepting members or contributions. The timeline for officially opening the project is measured in months from now, which may be minutes from when you are reading this. In terms of growth, the goal is to establish something like 3 nodes that form the seeds of 3 clusters through which we can establish a presence. We see potential for clusters of nodes in Canada, Cascadia, Maine, North Carolina, New Zealand, Central America, South America, Eastern Europe, Scotland, Asia, and well… all over really. We don’t see this as exclusive to any particular region, and actively seek to expand the concept globally. In addition to growth driven by members who wish to join us on the land, we see opportunities for the donation of land to the project by variously motivated individuals who may be unimpressed by the idea of conservation as pockets of contrived wilderness from which humans are excluded from living. We don’t view humans as separate from the wild, and we know there are many who own land and are looking for something deeper and more regenerative than wilderness as spectacle. 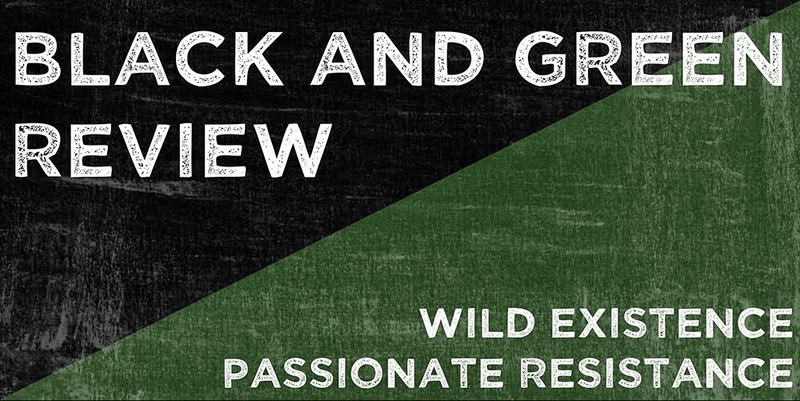 The digital version of this post originally appeared at Black and Green Review. A print version is available in BaGR Issue One.